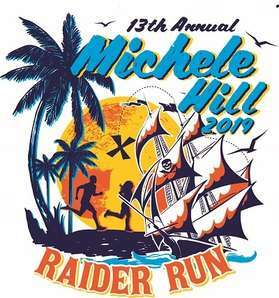 The 13th Annual Michele Hill Raider Run and Community Family Celebrationwill be held April 06, 2019, 7:30 AM at Navarre Youth SportsAssociation, in Navarre, Florida. DJ Cool Ice Water will provide thefinish line music. Jones and Company out of Destin Florida will perform afree concert after the race. Creative Catering by Mark Whittlesay will beserving the best Post Race Meal in the Area. There will be a raffle at no additional charge to the race participants. Prizes include a 2 Night Stay at Golden Nugget Casino Hotel, Biloxi, Mississippi, including dinner at Lillie's Asian Cuisine. Prizes also include a 58" TV, A Voucher for 4 to attend a Blue Wahoo's Game, Discount Navarre Select Physical Therapy Running Evaluation, Gift Cards and much more. The proceeds from the Michele Hill Raider Run are used to award $1000.00 scholarships to High School Seniors on raceday from Escambia, Okaloosa, Santa Rosa, Walton and Bay County Florida, andBaldwin and Escambia County Alabama. In our first 12 races, we have had over 3600 participants from 22different states, 50 different Florida cities, and the Metropolitan of France.With your help over the last 12 years the Raider Run has raised approximately $230,000.00 with all proceeds supporting education. Scholarship Applications are availableby clicking the handout tab to the left. ScholarshipApplications are also available at eligible High Schools Guidance CounselorsOffices. The Scholarship Applicationdeadline for Northwest Florida and South Alabama is Friday March 22, 2019. If you have any questions, please contact myself at 850-582-2946. Additional specific race registration categories, race awardcategories, and other race information can be downloaded by clicking thehandout tab to the left.